You’ve booked your holiday, you’ve worked hard and saved up for it and now the time is drawing near for that well-earned break and, you realize the trusty suitcase in the loft is well past its best. The last thing you want is for all your personal stuff to be cascaded all over the airport terminal when the zipper on it finally gives out. You want new luggage, of course, you want secure, sturdy and ‘travel’ safe cases to store your worldly holiday kit in, but where to start? The variety of available types of travel luggage is vast, different sizes, weights, styles are but three choice dilemmas open for the purchase. But ideally, you will have a rough notion of size, quantity etc that will best suit your upcoming break. From this starting point, you can grade different qualities in order of importance and this could prove a focus for your search. This guide will give you an inside look into ten of the best travel luggage options, helping you to at least narrow down your search for the hardiest and most functional luggage. The top three recommendations are based on choice, value and mid-range are offered as a starting point for you to head to the rest with a clear focus. The balance that is right for you is, obviously a personal choice through your own individual needs and requirements. It could be simply occasional travel luggage you want or something more substantial for a long haul trip or maybe you want a mixture of both – travel luggage comes in sets of varying sizes and capacities, and there should be a set here that will tick all your boxes. 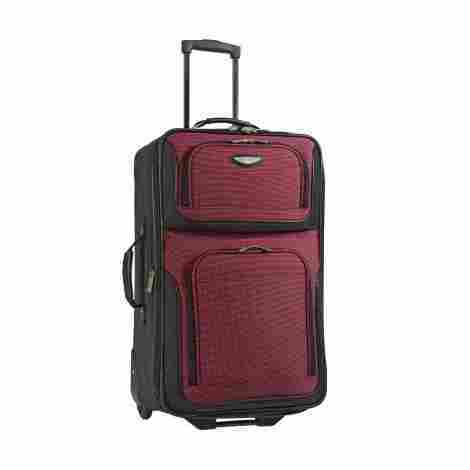 The Travelers Choice case is available in four colors; burgundy, gray, orange, and navy and boasts being manufactured with 1200D 2 tones polyester complete with PVC backing. The attractive design incorporates practicality and functionality with the style which benefits from two wheels and a set of fixed feet to prevent it toppling over when stationary. It has two sturdy handles conveniently placed on the top and on the side so it’s versatile enough for any trip. The handle is retractable, lockable and is released easily and simply with a push-button system. It also has a handy add-a-bag strap complete with a clasp for convenience in storing and accessing an extra bag up to nine inches in depth. The Travelers Choice case has adequate separate pockets on the front, one large and one smaller, both are zippered and lockable for security. And in the interior, there is another large zippered mesh pocket and two more that are suitable shoe holders. This case is offered in a good choice of colors, and the features incorporated within it are all useful, handy and convenient. The balance of the cost and value is equal, the quality of this case and its expandable versatility ensures great value for money. 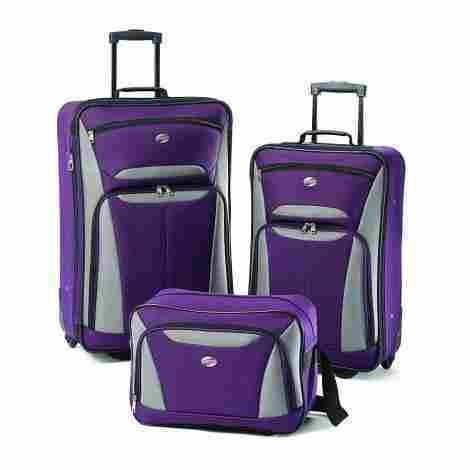 The American Tourister comes in a great set of three different sized cases that are available in a choice of three colors; purple/gray, black and red/black. 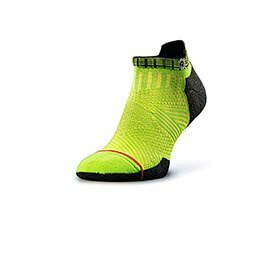 They benefit from being ultra lightweight by design and are made with reinforced corners to help prevent damage in and during use in the harshest of conditions. They are two-wheeled rollers and boast a locking handle that is easily deployed with a well-placed push button. The three pack of cases are not only ideal for traveling, they store inside each other when not in use. The smaller case is an ideal carry on, and the other two are perfect sizes for that family holiday. The robust wheels and casing make for smooth rolling. These cases have a substantial array of varying sized pockets that give enough space to separate personal items for easy location. The external pockets are zippered and can be locked securely with a compact padlock for added security. 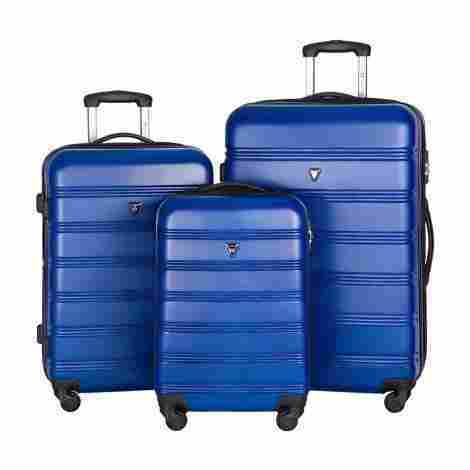 This American Tourister three-piece set of travel luggage is fully functional and versatile, the sturdy manufacture and quality of the make ensure that this purchase is excellent value for money and will withstand the test of time and travel. The Coolife Luggage set comprises three hard sided cases with varying sizes; one 28 inches at 9.2 lbs, one 24 inches at 4lbs and one 20 inches at 6lbs. They are available in eleven striking colors, each with sharply contrasting black trims and zippers, the four-wheel casings and the handle. These cases all boast an ergonomic aluminum telescopic handle which enables ease of movement of the fully 360-degree spinning strong and sturdy wheels. And as a bonus, they are easily stacked within each other for compact and tidy storage when not in use. Each interior has a separating zipper compartment and a set of retaining straps so no looser flying clothes when the cases are opened. The internal storage is more than adequate to fulfill the needs of many family trips with ease. The hard sides are made with quality ABS (acrylonitrile-butadiene-styrene) material that ensures they are tough, hard wearing and lightweight all at the same time. This gives confidence that fragile items within will be kept as safe as when they are packed. The money spent on these cases will be money well spent, the quality and durability of them will last for a multitude of trips and the security features that include the locking system only serves to add value to an already outstanding product. The US Traveler duo set comprises one case size 21 inch upright and weighing in at 6.6 lbs and a handy tote bag that is 15 inches and a mere 1.3 lbs. The set comes in a choice of six pleasant colors; blue, green, royal blue, purple, red and mustard/orange, all complemented with stark black for visual impact. The case has a sturdy top and side carry handle for when the going gets uneven, and the tote has a bonus detachable non-slip padded shoulder strap. Carrying gets a helping hand with a useful bottom grip handle. The polyester is 1200D and the rigid design will keep the interior sound and safe from harsh environments. It benefits from metal hardware so security is peace of mind, and they keep the insides protected with an EVA padded front. The capability for expansion is ideal when going on holiday if there’s more room required for extra spontaneous purchases it removes the need for packing an extra ‘just in case’ bag. The 25% more packing power is a real bonus. The value for the two piece set from US Traveler set is added to with the features included, the lining and strapping on the interior, the tough hardware included means this set is great value for money and is designed to last. 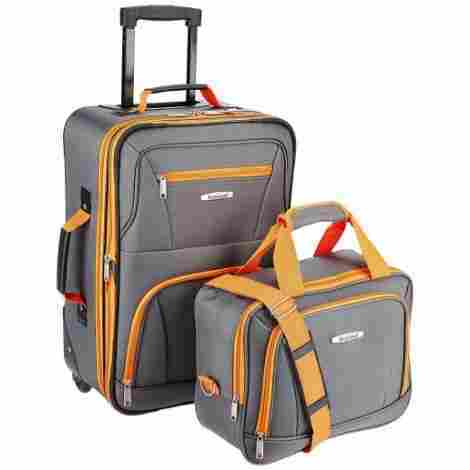 This Menax Travelhouse luggage set comprises three useful sizes of 20 inch, 24 inches, and 28 inches, meaning there is more than enough space for a whole family to take on holiday. They are manufactured with ABS for durability and an ultra lightweight case. The strong four wheels ensure a smooth multi-directional run when it’s needed most, and the sturdy handles are placed at the top and the side for easy carrying when wheeling isn’t an option. The choice of ten vibrant and individual colors should mean there is one to suit everybody. The expanding feature on these cases offers an alternative to taking extra baggage away for the must-have purchases, the extra room gives a healthy twenty five percent boost. And the functionality is increased with this useful expansion feature. Each Merax Traveler case has its own secure locking system, this allows the cases to be individually locked with a unique code, and to add to this benefit - even when the cases are expanded the locking system is still fully functional. The mid/high range place on the pricing market these cases hold is fully justified with the improved technological features such as better handles. The overall value and cost are equally and rightly balanced with the great product for any holiday or break. The well-known brand offers the Samsonite Winfield 2, it is readily available in a choice of 7 great colors; deep blue brushed anthracite, brushed black, charcoal, emerald green, orange, and purple. It benefits from four multi-directional spinner wheels for a completely smooth run. The case is hard sided and will protect contents from shocks and impacts to ensure they are not damaged in transit. The tidy and lightweight handle is telescopic and locking for convenience. The features with the Samsonite Winfield 2 include a fully zippered internal divider to keep items separated, and the two restraining straps will stop clothes toppling out when the case is opened. It boasts a total of ten oversized pockets so speeding up locating specific items from within. The exterior front and back shells are coated to help reduce the abrasive scratches caused in everyday use, the unified brushed pattern is a Samsonite custom brand and promises to keep the case looking new for longer. The cost and value of this reputable case and brand are easy of equal measure, the manufacturing and technology used in the production give confidence upon purchase that this case will last, and makes it excellent value. 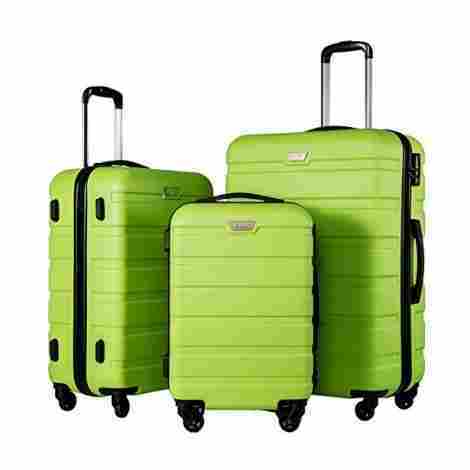 These Rockland Luggage sets are available in a huge range of colors ensuring there is a set to suit everybody. The case is nineteen inches upright and has ergonomic, padded top and side handle for comfort when carrying the case is required. The wheels boast being inline skate wheels with a stability bar, this should ensure a smooth run and long-lasting travel. The tote bag has a fully detachable, adjustable and non-slip shoulder strap. The case has an array of dividable storage options, the front has two zipper large pockets, which can be padlocked for added security. And the inside is fully lined with three functional zipper pockets to keep important items separate. The tote bag has a full printed lining and an adjustable and detachable shoulder strap for convenience. Both items benefit from having industrial strength metal wear to ensure they can stand up to the task in hand securely. 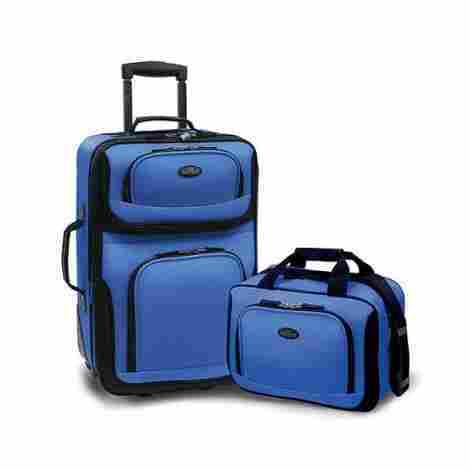 The heavy-duty EVA-molded Hi-Count fabric is combined with style and full functionality, the tough metalware on the cases and practical design make this Rockland Luggage sets a great value for money. 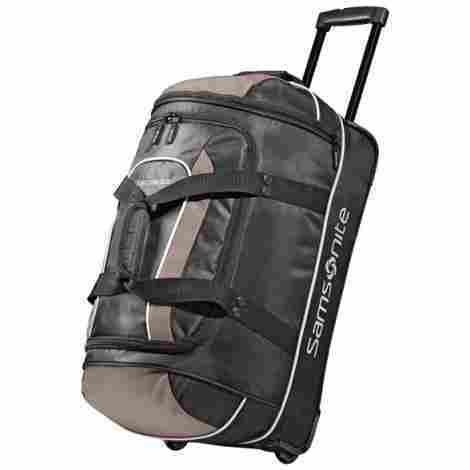 This practical and fully versatile Samsonite Andante Wheeled Duffel is available in four colors; black/gray, black/red, black and gray/lime. The lightweight duffel has a large U shaped opener for quick access to the interior and it boasts a good number of different sized pockets for secure storage of smaller and/or personal items that require easy access. The wheels have shock suspension and soft spin wheels for a superior run. The twin handles attach together and make carrying a breeze when it’s required. It benefits from a lockable upright handle that stores away neatly when not in use, and the zippers can be secured with a compact padlock for security. This ideal duffel is fully practical for those shorter off the cuff trips, there is enough room to pack essentials and more in this cavernous bag. It stands upright when packed and is tough enough to cope with usual knocks and bumps when traveling. When all the features are taken into consideration with the durability and functionality of the Samsonite Andante Wheeled Duffel, the value and cost when measured are equal, overall this duffel is money well spent and it is a product designed to last. The Olympia duffel bag measures an impressive 22 inches and boasts having eight different sized pockets for safe storage of smaller personal effects. It is available in a good choice of color combinations and is produced using strong 1200D polyester which is very durable. It has a standard U zipper opening on the top for easy access, it boasts self-repairing zippers too so no more accidents at the most inopportune moments. The handle is pulled for quick access and hides away neatly when not in use, and the wheels are in line skate wheels that are designed in a recess so reducing the possibility of causing them to catch and break. The base of this Olympia Luggage duffel has two substantial feet that reduce abrasions and wear and tear when the duffel is laid flat, the handle zips away neatly when not in use so won’t catch when the bag is being carried by the handles. The functionality of this bag, combined with the great features like the self-repairing zippers, mean that both cost and value are measured equally and money spent on this product is definitely money well spent. 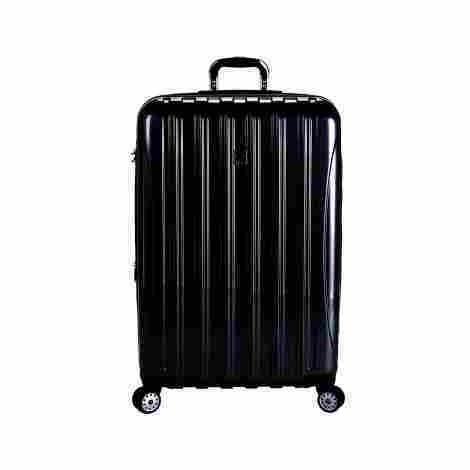 The Delsey Luggage case is manufactured in 100% polycarbonate which ensures it’s toughness and durability, this is finished with a nice deep metallic finish. It benefits from double spinners and this means less stress on the upper body when pulling/pushing it along. As a neat bonus, this case expands by a generous two inches for those extra bits acquired when on holiday, and the fully lined interior gives neater packing. The case has TSA accepted locks which means you have security and confidence when traveling through checkpoints. And the neat handle has the capability to be locked into two different positions for tailored comfort on any trip. The interior has a unique design which includes web straps and a zippered divider to enable neater packing. The compartment in the lid also has a zippered divider so all personal and valuable effects can be stored individually. 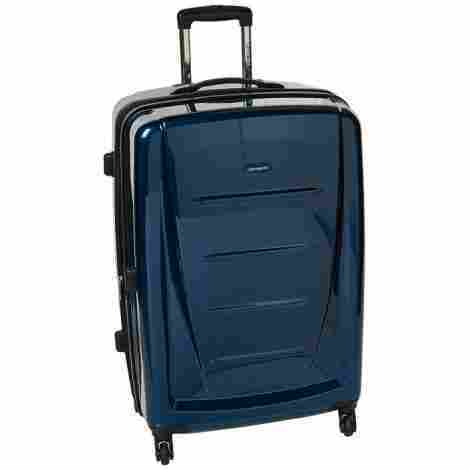 The Delsey Luggage Helium Aero spinner trolley is made with sturdy, strong and durable polycarbonate, the TSA accepted locks as well go together to make up just a part of the value in this product, money well spent on quality. So hopefully this comprehensive guide will give you a bit of a heads up in your search for your ideal travel luggage. Whatever the size you are looking for, for whatever destination; there is sure to be a suitable choice to suit your needs. Some say that size doesn’t matter, and whilst this may be true for many things in life when you’re traveling the size of your luggage most certainly does matter. Whether your journey is local and short, or long haul and for longer periods; the last thing you want to be slowed down by is incorrect sizes of travel luggage. For independent travel, or traveling by coach or train the size of your luggage has to be taken into account, and of course, it is vitally important to get the size right if your travels are taking you on an airplane. Restrictions in size are common not only for cabin luggage but also can be restricted for main hull carriage. Checking where you are going and any specific restrictions is a great place to start when you’re traveling luggage hunting. A wheeled duffle is a great option if you’re prone to quick trips and last minute breaks, they can carry a surprising amount of gear and are versatile enough to be carried or pulled. The safe strapping most have also allowed you to secure it for when it’s in the hold. They come in a great range of sizes and there are even smaller types that are compact enough to be used as hand luggage- saving masses of time at check-in! Wheeled travel luggage is probably what we most think about nowadays when we are planning a trip, they are sturdy, wheeled and handled and have a great range of interior features that may include zippers, strapping, separate compartments and some may even have an extending front for those ‘extras’ you buy when you’re on your holidays. An alternative is a wheeled backpack, they are a mix of the wheeled duffle and the wheeled travel luggage. The difference is they are often much lighter to carry even when packed up, and they can offer a great versatility when your travel takes you over different terrains. For walking, you can wheel them, and if you’re faced with stairs or busy areas you can simply transfer it onto your back. We are probably all a little guilty of thinking that luggage material is all much the same, but there are a few marked differences that can affect many aspects of your chosen luggage. There is no right or wrong type of material, this is down to personal choice and your individual needs and requirements. The leather is a traditional material for travel luggage because it is very hard wearing and tough, however, it is heavy and can add weight to an already restricted area when we travel. Nylon is much lighter and is almost as tough as leather but doesn’t tend to be as hard wearing in its own right. For a tougher, more resilient nylon, the ballistic synthetic nylon is probably a better way to go. It is hard wearing, and designed to reduce tearing and stresses from abrasions. It is easier to keep clean and a great option for a soft-sided travel case. Another tough material is Cordura, this is also a common soft sided option that is just as tough and durable as ballistic nylon but it has a benefit if being lighter. Cheaper and lighter still is the polyester option. This material tends to be found at the lower end of the price range and you should check for high quality if you choose this type. Checking the denier of the polyester is generally a good indication of the toughness and functionality, and a good indicator for you to look out for is in the 500 – 2000 denier range for better quality and strength. For hard sided travel luggage, there are a few decent options on the market. An aluminum shell is a traditional classic and has been available for a considerable time. No surprise then it is one of the more expensive materials used and but is equally at the top of the toughness scale. A cheaper alternative that is increasingly available is polycarbonate, this material is molded thermoplastic polymers and is available in a wider range of colors, styles, and patterns. It is lighter than aluminum and benefits from being impact resistant, this is a great feature because we know how our travel luggage goes through the mill at airports. Polypropylene is another thermoplastic polymer and is even lighter than polycarbonate, it is still resistant to impacts albeit in a reduced manner; this hard casing is tough enough to keep your fragile kit in one piece for longer. A cheaper version is available in the thermoplastic range in the form of ABS (acrylonitrile-butadiene-styrene), this is lighter still and is still hard wearing. You can find blends on the market too, for instance, polycarbonate is mixed with ABS for a tough alternative that is cheaper and lighter than polycarbonate as a single material. It’s one thing sorting out the outside of your travel luggage, but you may also want to consider the different features different luggage has to offer. Checking the internal space is important because the inside doesn’t necessarily match a huge exterior. For example, if you have a wheeled case, you need to remember that the wheel housing and handle housing take up internal space. Curved cases also affect the internal size, a good way to confirm is to check the capacity of the luggage. Usually, this will be provided in liter form, but may also use cubic inches so it’s best to ensure the liter size matches your individual requirements. A good substantial set of grab handles is always an essential integral part of the luggage, these come in really handy when the wheels are not able to be used safely so they need to be strong and tough enough to hold the overall weight of the luggage. Inner zippers and elasticated compartments are always handy when you’re traveling, allowing safe placement for valuables like your passport and wallet. Compression straps inside are handy too, they allow a better compact grip around your kit and stops it from spewing out when you open the lid. And an expanding feature is a good idea, some luggage has this extra bit within a secondary external zipper route so you don’t need extra bags. Some come attached to larger cases and can be lifted with ease for convenience when you’re traveling and need both your hands. Q. Is hard or soft-sided travel luggage better? Q. What size should I buy? A. Again, that is up to you once you know how you are traveling, where to and for how long. If you’re traveling on an airplane it’s always best to check with the specific airline you are traveling with to get the best advice on size limitations. 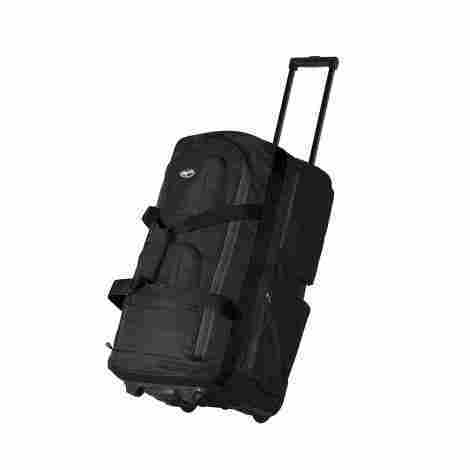 If you are traveling light for a weekender on public transport, then the best option may be a softer wheeled duffle or wheeled backpack, and for longer trips, depending on what you want to take, you can choose a suitable wheeled case that is appropriate for the terrain you will be frequenting the most. Q. Are the travel cases waterproof? A. This will depend on what material your travel luggage is made from, the hard sided luggage will be water resistant and soft-sided luggage should also have some level of water repellent. Always best to check the products individual specification information to be sure though. Q. What features should carry on luggage have for optimum usage? A. Most airlines require a carry on bag be no more than the size of 45” in total. Add the depth of your case, to the width and to the height if it comes to less than 45 inches you should be ok. Make sure the wheels are sturdy and in good working order with no cracks or obstructions. A great feature to look for is the extra external zippers and pockets – these are priceless and save loads of time hunting for small personal items in restricted seating. For your more personal and/or valuable items – check the luggage has interior pockets too, vital for the spending money and passport! Q. Are two wheeled cases better or worse than four-wheeled cases? A. Four wheelers are generally ‘spinners’, that is they can be moved easily in tighter spaces and place less stress on your body when maneuvering them. The wheels are mounted outside the case so can be prone to knocks and bangs which can eventually reduce the lifespan. Two wheelers are commonly referred to as ‘rollers’, they are useful for pulling behind you in busy areas and are easy to get up and down curbs and bumps in the sidewalk. They only move forward and backward so movement may be restricted in smaller spaces. It’s up to personal choice at the end of the day, both have good points and small niggles.